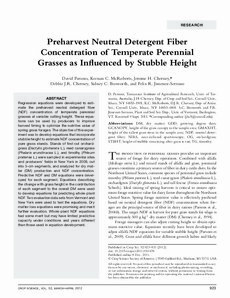 Regression equations were developed to estimate the preharvest neutral detergent fiber (NDF) concentration of temperate perennial grasses at variable cutting height. These equations can be used by producers to improve harvest timing to optimize the nutritive value of spring grass forages. The objective of this experiment was to develop equations that incorporate stubble height to estimate NDF concentration of pure grass stands. Stands of first-cut orchardgrass (Dactylis glomerata L.), reed canarygrass (Phalaris arundinacea L.), and timothy (Phleum pratense L.) were sampled in experimental sites and producers’ fields in New York in 2009, cut into 5-cm segments, and analyzed for dry matter (DM) production and NDF concentration. Predictive NDF and DM equations were developed for each segment. Equations describing the change with grass height in the contribution of each segment to the overall DM were used to develop equations for predicting whole-plant NDF. Two evaluation data sets from Vermont and New York were used to test the equations. Dry matter loss equations were promising and merit further evaluation. Whole-plant NDF equations had some merit but may have limited predictive capacity under conditions and years different than those used in equation development.